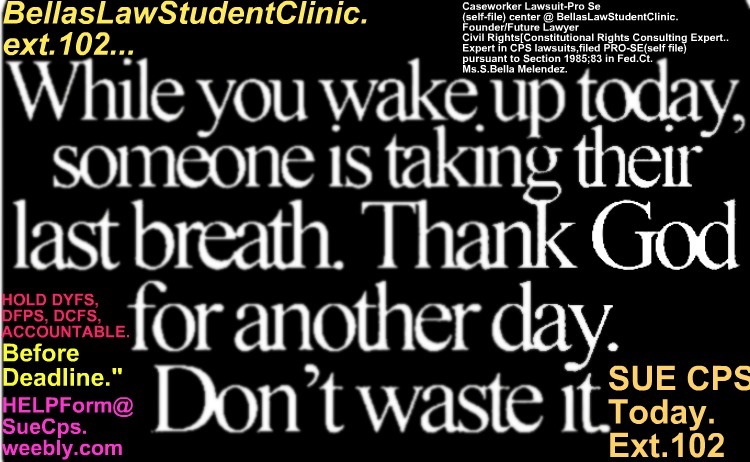 There comes a time when GOOD New Jerseyans/Families who are raising such child right in life,with education,healthy child nurtured properly,as records reflect,there comes a time when such people are simply just tired of the unlawful and the continued ongoing unconstitutional seizure under 4th amendment,per child by child protection services,dyfs. ext.102. Removing a child by DYFS,DCPP caseworker,supervisor those of such Good,such innocence are fed up,tired of the visible CPS trampling over such Parental/Children rights,the right to raise one's family,without the ongoing interference of a outsider,attempting to "come-in" unwelcomed. Such child/mother/family relationship- is one that cannot be broken,unless by force. Such lawsuit involving the owner against NJ DYFS workers,as media validate was filed by method of pro-se.Most did not even know until reaching our student ctr. 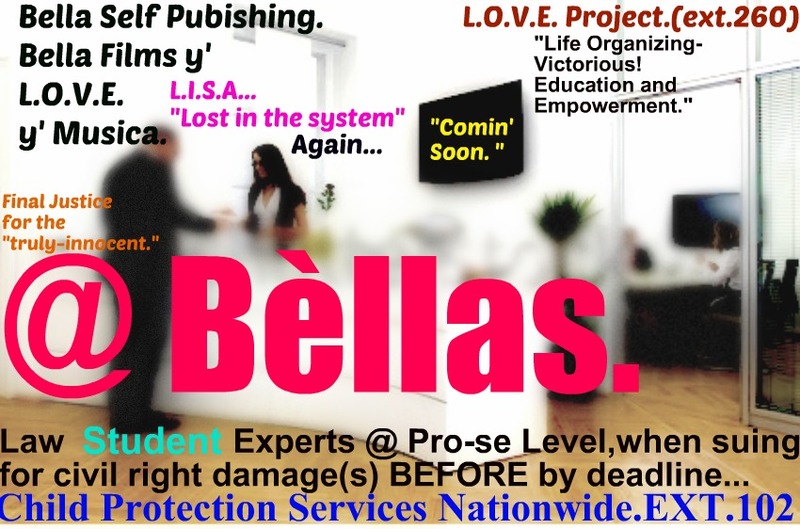 (those who have time to sue pro-se self file) did not even know they can sue for such civil right damages against the worker,without any further delay,while your still searching for law... 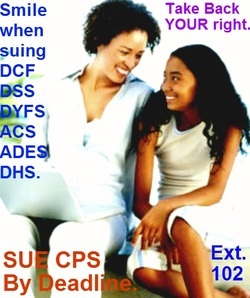 Even though 99.9% in NJ are not suing abhorrent DYFS,DCPP as well as states all over from California,KY,MI.,Oregon,MD.,to PA.,nationwide it is up to you to say ENOUGH and get your suit filed nevertheless known as pro-se self file... and hold DCPP,DHS,DCF,DYFS accountable. Smile when your finally realizing that the commencement of your warranted suit against Burlington,Warren,Somerset, Cumberland, Union,Essex,Morris County,throughout the state of N.J. that your able to have a reliable support-at pro-se (self file leve)when your ready to institute your suit against C.P.S. caseworker assigned ,shall be challenged,at first state level-Higher Court of Appeals/Supreme Ct. But yet?Where is the "reform?" It do not exist to most in NJ. ext. 102. Rest in Peace to so many others who did not have to DIE under NJ DCPP,DYFS ostensible "care." SEXUALLY ABUSED repeatedly while DYFS workers,in Union County,to South Jersey were lieing under oath to ensure child "remain put." Medicated,under DYFS wonderful"care"and supervision, why is that? D.Y.F.S. assume they will just"go away"once the child "age-out"but we know personally this is not the case. NAME ALL WORKERS,WHO HAVE CONTINUALLY-violated at such grave/severe nature,your constitutional right,as per child. Read more below or fill out HELP FORM above by clicking on link to begin consult,pro-se self file level today.Ask for ext. 102. Why is a child being medicated who has NO HISTORY warranted psychiatric-medication,or a inpatient medical/hospitalization? Yet, caseworkers are lieing under knowingly to "keep child as is." More suits hence as studies show shall follow regularly,by you the pro-se self file litigant timely." Several Innocent Good Souls,Foster Kid,Parents,Grandparents etc. I am ready to sue child protection services-dyfs. Can i sue DYFS for lieing under oath,withheld evidence,manufactured report(s)to make it appear i was a abusive parent? Can i sue DCPP if my child was raped,injured in foster care while i was home and"available to take her?" Can i sue the DCF in New Jersey,for removing my child to another state,and or was preparig to do so illegally? 1. )Right to have child reside in your home. 2. )Right to have child/family unit remain In-Tact. proffered by the State of New Jersey agency caseworker. 1. )Child gone missing,but yet your told under oath in court,phone conversations,through the mail(by comissioner in charge,to Director of DYFS,DCPP,et;al staff at DYFS,those who are directly-link to your state case-your child,and or children are thriving,doing well,no issue,and how they are in school each day,and or that there is no "risk"to any of the children,how the"caseworker is visiting the child regularly and all is well with YOUR child. to kill her/himself premise on not being happy/nor able to return to your primary loving care. FILE SUIT AGAINST NEW JERSEY DYFS,DCF,DHS,DCF,do not wait until your child,and you are left without ever being able to attempt to hold CPS accountable.ext. 102. If your suing astutely as owner/founder melendez filed timely pro-se,self file we wish you always the best of luck.